Hodges, Dana Dale Moore, 50, of Louisville died Sunday September 30, 2018. She was a certified nurse’s aid and a certified medical technician. 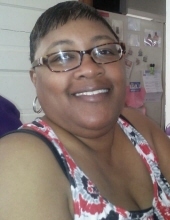 She is survived by a daughter Killian E. Barnes; a son Shaquille S. Smith; her mother Pam Hinkle (Charles); brother Brock A. Hinkle (Trena); two grandchildren Breanah J. Barnes and Dreya A. Smith. Her funeral service will be held 11:00 a.m. Saturday October 6, 2018 at North Central Church of Christ 101 N. 35th Street, with burial in Green Meadows Cemetery. Visitation will be 5-8 p.m. Friday at the church. To send flowers or a remembrance gift to the family of Dana Dale Moore-Hodges, please visit our Tribute Store. "Email Address" would like to share the life celebration of Dana Dale Moore-Hodges. Click on the "link" to go to share a favorite memory or leave a condolence message for the family.